This super easy Sweet Potato Squash Mac and Cheese is a deliciously healthy take on the traditional mac and cheese recipes and it’s ready in under 20 minutes! Guys, let me just have a second to reminisce on the deliciousness that I devoured a few nights ago in the form of Sweet Potato Squash Mac and Cheese. Boy, was it good! Funny enough, lately, I’ve been steering clear or high carb foods in hopes of getting this bod in the best possible shape for my upcoming vacation (yes!). Speaking of vacay, remember how I told you that my awesome friend Brandy invited me to Panama City Beach with her family back in June? It was a week full of good vibes, good laughter and GOOD food. In fact, we had such a great time, that literally a week later, Brandy called me and said “Soooo, I think we’re gonna book another vacation…for August.” I think it’s safe to say that I participated in another round of excited screams and happy dances! Since you can never (never ever) go wrong with mac and cheese, I decided to healthify things up to make this delicious meal both satisfying and nutritious. Surprisingly, the creaminess in the sauce isn’t due to excessive amounts of cheese. The thick, creamy sauce is made from a combination of sweet potato, butternut squash and almond milk. A little cheese is added in the process, but can totally be omitted if you are looking for a vegan friendly version. Still irresistibly good either way! Add the macaroni to a medium sized pot and fill with water. Cook on medium heat until the pasta is tender or your desired texture. Approx 6-8 minutes. Add the butternut squash, sweet potato and almond milk to a food professor and pulse until the mixture becomes a smooth and creamy sauce. Transfer the sauce to a large saucepan and add the sharp cheddar cheese (omit if using vegan friendly version), garlic powder, Dijon mustard, salt and pepper. Cook on low/medium heat until the cheese has fully melted. Drain the cooked macaroni and add to the sauce. Using a large spoon, fold in the sauce until the macaroni is fully covered. Top with extra cheese and Panko breadcrumbs (optional). Enjoy! Sweet potato and butternut squash in Mac and Cheese??! I'd never have thought of that, looks delicious! Like WHOA. This looks like my dream dinner! Girl...I still dream about it! Oh this must be delicious!!!!! I can't wait to give this one a whirl! I hope you love it, Tina! VAcation time is always the best! But I am loving this version of mac and cheese! Got to try it! Eeeek, counting down the days! I hope you like it, Meeta! A great (sneaky) way to get some wonderful nutrition into mac and cheese!! Love it, and your photos are wonderful! Makes me want a bowl right now! I'm allllllll about cramming as many veggies as I can into one meal. Thank you, CC! Why doesn't anyone call me up and say -- sooooo -- let's go on vacation! Aside from the fact that I'm jealous -- I'm also hungry. This looks amazing! 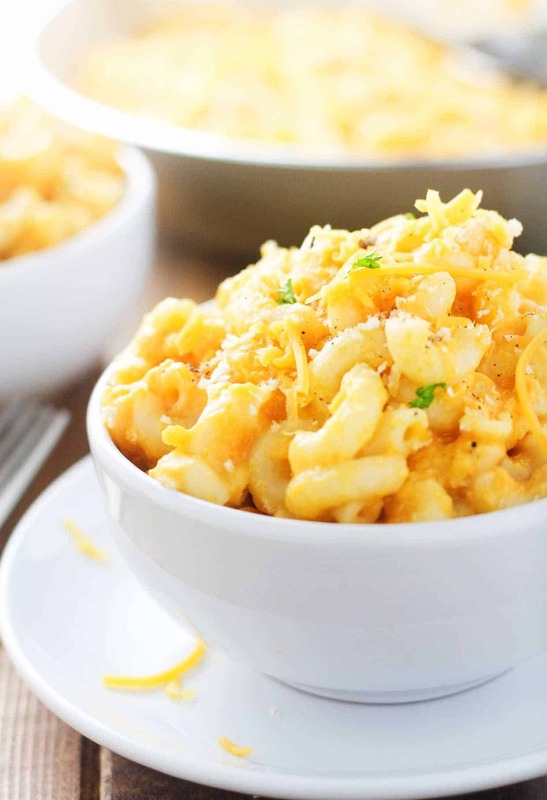 I love mac & cheese and never thought to use sweet potato or mustard. I'll need to try this. The sweet potato gives the sauce a nice, sweet kick and it makes it creamier. It's a must try, Cynthia!